As the new Transformers movie release draws near, merchandising mania starts running wild. Personally, it's my favorite part of a new TF movie. There's TF imagery on just about everything and all sorts of TF editions of products. It's like having BotCon in my local Walgreens. Seeing as there is to be a new TF movie every year for the foreseeable future, I'm certainly going to enjoy the onslaught of licensed products available. The BBQ Double Stackticon from Burger King. While Revenge of the Fallen wasn't the highest praised of the Transformers movies, it's licensed tie ins will forever hold a special place in my heart. Most specifically it's junk food items. Each movie season since I hope for a return of the items released that fateful summer of 2009 with Optimus and company proudly on the packaging. Pictured above is the wonderful BBQ Double Stackticon from Burger King. Burger King had kids meal toys for movies 1-3 as is, but for part 2 they included a wonderful bacon double cheeseburger with bbq sauce that was pretty low priced. I must have eaten enough to fill Unicron and still want more. I know, it sounds so simple, but it's usually the simple things I'd rather have on any menu. Tie that in with Transformers (which, I kinda like or something) and I'm buying it every time. There's literally a Burger King just a few blocks from my workplace, if they brought that back, I'd probably have it every night for lunch. Admittedly that's probably best for my own health... but... shut up. I usually don't eat a lot of M&M's. Not that I have anything immediately against them, I just don't. If I do eat M&M's, it usually the peanut butter kind, because I'm pretty crazy for peanut butter and chocolate candy. 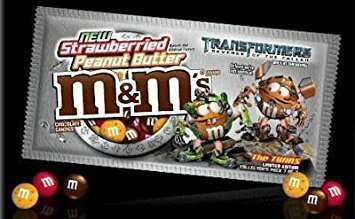 So when TF2 came out and M&M's had a tie in flavor that was based on the kind I eat normally already, I was sold. Turns out these were crazy good. 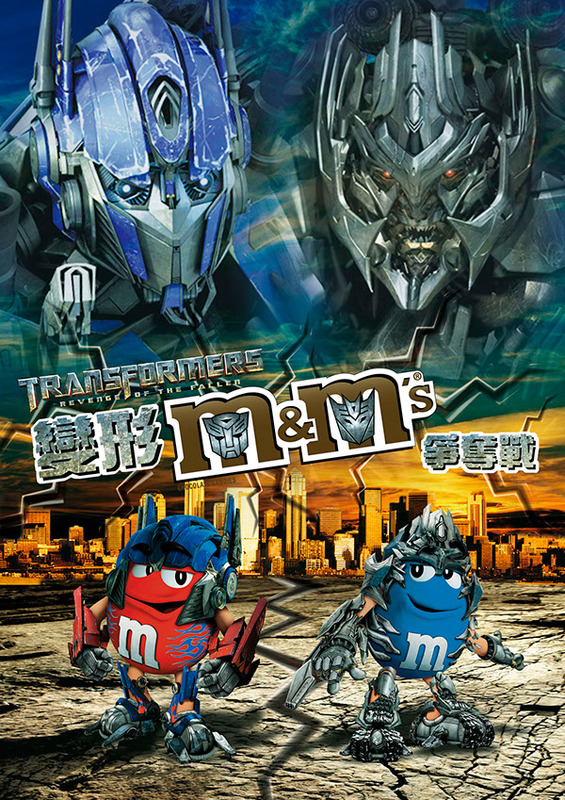 So good they went into normal M&M packaging after the Transformers deal went out. Essentially it was just a regular peanut butter M&M with a touch of strawberry flavor (get it, it was a pb&j candy). 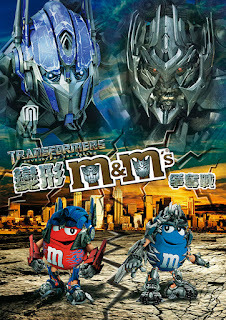 There was some sort of mail way promotion with M&M's to get an Optimus Prime candy dispenser. I should have taken advantage of that, I certainly bought enough of the candy. I shouldn't have brought that up. I've already lost enough sleep over it. I kinda hate myself for it. This is the Lexus of candy bars. The most important tie in ever was, the Bumblebee Snickers bar. This was the luxury cruise, the first class, the biggest diamond ring of a candy bar ever. While by all looks it was just a Snickers bar with the nougat dyed yellow... it most certainly was not just that. Food coloring used in commercial food products has a flavoring that is just wonderful. Next time you're in the baked goods aisle, buy one of those crazy color cake mixes and frosting. It's just so much better tasting than the yellow cake and vanilla frosting that it is allegedly based on. You'll see. So there was this wonderful Snickers bar with Bumblebee proudly on the label. As I mentioned just now, it tasted better, sweeter and just high five awesome. I stockpiled these. Even as movie hype winded down, I found stock at discount stores and piled them up. I cherished them and mourned them when they were all gone. Each and every movie season that has come and gone since 2009 I've hoped for it's return, only to buy a regular Snickers and inflict my disappointment upon it. It's just not the same. I'm just hoping that Bumblebee solo movie can give me hope. Because I'm going to hope anyway.